Cardcaptor Sakura - Clear Card Arc manga will get a television anime series adaptation in January 2018, which would be revealed on the January issue of Kodansha's Nakayoshi magazine (out in Japan in December 1st). Morio Asaka returns to direct the new anime at Madhouse. Cast is returning for the series, too. 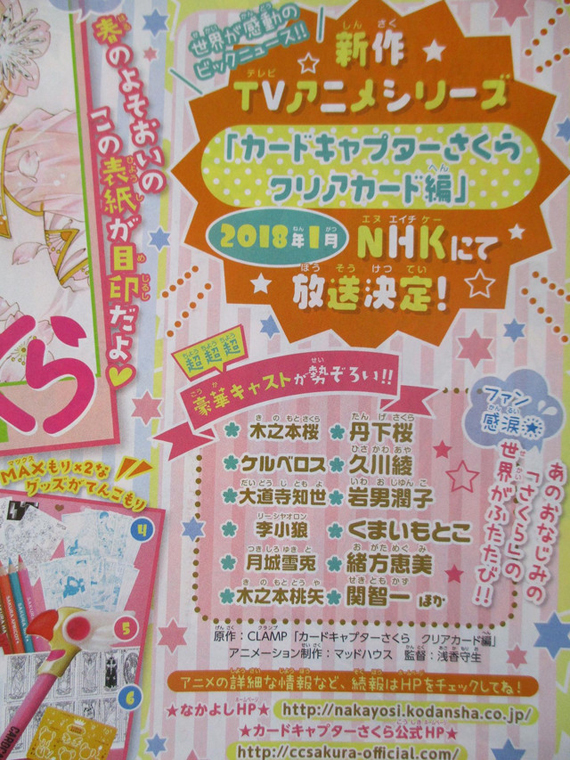 The December issue of Nakayoshi had hinted that the January issue would feature news related to the new anime project. The original Cardcaptor Sakura manga series ran in Nakayoshi from May 1996 to June 2000, and published 12 volumes by Kodansha from November 1996 to July 2000. It inspired a 70-episode anime series in 1998, a movie titled Cardcaptor Sakura: The Movie in 1999, and Cardcaptor Sakura: The Sealed Card followed in 2000.